A wise man known as Agent Dale Cooper once said, “Every day, once a day, give yourself a present.” Tonight, mine is a pilgrimage to 142 Rue Montmartre in the first arrondissement — an unremarkable, unassuming edifice from the outside. But as David Lynch fans know, things are not always what they seem. Cut to me ensconced in an underground Paris den, watching the Cambodian chanteuse of a band named after a viral infection sing in Khmer about shaving a beard. No, I’m not trapped in a Lynch movie. I’m just soaking up the atmosphere at his swanky bar/performance art space/vanity project, opened in 2011 and named after the rather more bizarro Club Silencio in his LA noir Mulholland Drive. And appropriately enough, we are plunged into eerie silence as we descend the six flights of stairs (described by my companion as “rapey”) into the belly of the beast – a sleek yet intimate space decked out in gold-leaf and smooth crystal, designed by Philippe Starck to the iconoclastic director’s specifications. As a discreet sign on the wall indicates, taking photos is strictly forbidden, and I just couldn’t bring myself to defy the revered creator of Twin Peaks and Eraserhead. While I wasn’t expecting a David Lynch-themed amusement park, in spite of myself I did keep an eye out for dancing dwarves, one-armed men, cranky log-toting women and, of course, the distinctively coiffed auteur himself. None of these materialised. Neither the directions from the metro nor the interior layout were as confusing as those associated with The Black Lodge. But there were irrefutably Lynchian touches, like the heavy velvet curtains (not in his trademark red or blue, but a muted coral), the retro proscenium arch low and wide over the small stage, and toilet seats as black as midnight on a moonless night. 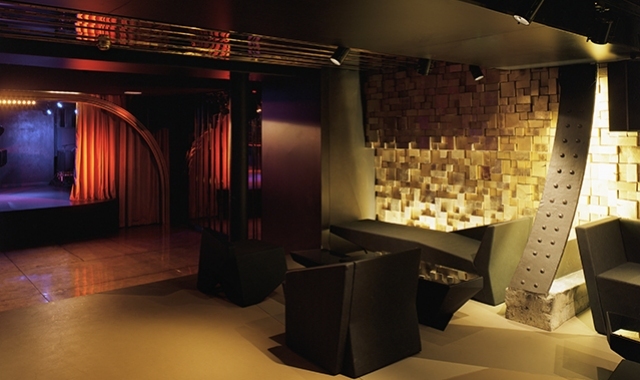 Lynch oversaw every detail right down to the plush cube seating (upholstered in – you guessed it! – velvet), which he designed to “induce and sustain a specific state of alertness and openness to the unknown”. I’m not sure it worked, because the dispassionately chic VIP crowd was reluctant to vacate them to dance – a crime with such hauntingly tuneful Cambopop gems to dance to. Chhom Nimol, the feisty frontwoman of Los Angeles-based Dengue Fever, wasn’t too impressed with all this Parisian hauteur, but her coy, infectious energy soon spread like, well, a tropical disease. “Don’t be shy!” she teased – then, tossing her tresses impatiently, ordered everyone to “make your body hot; shake it, baby!”, one moment coaxing the audience to sing and dance à la a-gogo; the next quieting the band to sing a cappella, accompanied by her own delicate hand gestures and the traditional finger cymbals known as chhing. Pogoing across the stage, the band matched Nimol’s high spirits from first chord to last. Together the five-piece looked an unusual bunch; they could have walked right out of a Lynch film, what with the guitarist’s Eccentric Artist-certified beard and a bassist in a Hawaiian shirt who towered over his bandmates. So there was a giant, after all. That’s one thing I can tick off my Twin Peaks list.